High-quality injury surveillance data is crucial to preventing injuries and promoting safety. 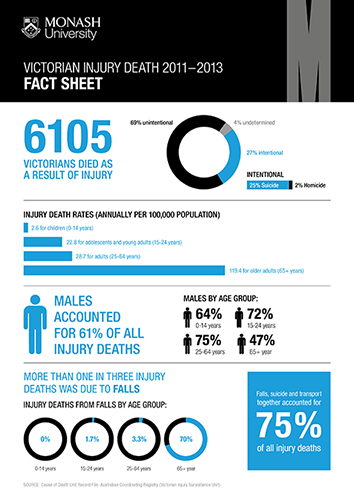 The Victorian Injury Surveillance Unit (VISU) analyses, interprets and disseminates data on injury deaths, hospital admissions and emergency department presentations in the state of Victoria. Access to quality injury surveillance data provides immense research potential and is crucial to the development of effective injury prevention and safety promotion. The Victorian Injury Surveillance Unit (VISU) has been analysing, interpreting and disseminating Victorian data on injury deaths, hospital admissions and emergency department presentations across the state, nationally and internationally for more than 25 years. Data are used to underpin government injury prevention policies, stimulate research and to develop and evaluate prevention strategies and measures. These include community awareness initiatives and education, legislative and regulatory changes and safety-related environmental, equipment and product design improvements. This critical information is provided to around 250 organisations and agencies each year, including Commonwealth, state and local government departments and agencies, health and injury prevention organisations, media, business and industry, education institutes, research groups and the community. VISU holds de-identified data for Victoria on injury deaths, hospital admissions and Emergency Department (ED) presentations. Data are held on three separate datasets - they are not linked. Death data are supplied by the Australian Coordinating Registry and the Victorian Registry of Births, Deaths and Marriages. Hospital admissions and emergency department presentations data are supplied by the Department of Health. Data and separate reports are also published for professional and community audiences, such as government departments and agencies of all levels, health and injury prevention organisations, media, business and industry, education institutions, research groups and the community. VISU data is included in the Department of Health produced local government area and regional health status profiles.